The Medical Schemes Amendment Bill, the NHI Bill and the NHI Bill and the Report of the Health Market Inquiry of the Competitions Commission. 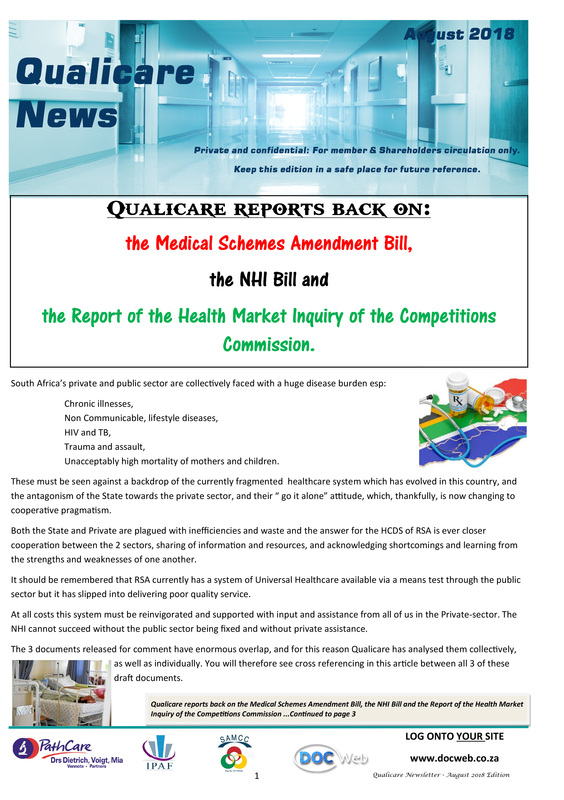 Qualicare reports back on the Medical Schemes Amendment Bill, the NHI Bill and the report of the Health Market Inquiry of the Competitions Commission. Unacceptably high mortality of mothers and children. These must be seen against a backdrop of the currently fragmented healthcare system which has evolved in this country, and the antagonism of the State towards the private sector, and their “ go it alone” attitude, which, thankfully, is now changing to cooperative pragmatism. Both the State and Private are plagued with inefficiencies and waste and the answer for the HCDS of RSA is ever closer cooperation between the 2 sectors, sharing of information and resources, and acknowledging shortcomings and learning from the strengths and weaknesses of one another. It should be remembered that RSA currently has a system of Universal Healthcare available via a means test through the public sector but it has slipped into delivering poor quality service. At all costs this system must be reinvigorated and supported with input and assistance from all of us in the Private-sector. The NHI cannot succeed without the public sector being fixed and without private assistance. The 3 documents released for comment have enormous overlap, and for this reason Qualicare has analysed them collectively, as well as individually. You will therefore see cross referencing in this article between all 3 of these draft documents. Plethora of confusing and incomparable options. The MSA amendment bill must be responded to by 21 Sept. 2018. After this period of public comment a protracted period of discussion and red tape will follow before these Bills come before parliament where they will be debated and eventually become an Act of parliament. The Act will, at best be published in mid-2020, where after the regulations will need to be written and put out for public comment, which again could take up to a year to finalise. So there is no rush, and no cause for mass panic. This does not mean that you should sit on your hands and do nothing, so read on…………. The MSA and the NHI bills read in conjunction with one another, open the door for significant Primary Health Care opportunities for Primary Care practitioners. You will, in all likelihood be eligible to service a panel of NHI patients, in addition to your medical aid patients. Certain state medical aids will, in time, collapse into the NHI, but not in the short term. We all understand that payment by the NHI will be by way of Risk Adjusted Capitation. All evidence to date points to the NHI interacting with Family practitioners for Primary Health Care either in their current rooms, or in state clinics, on a capitated basis. The commonly quoted figure for PHC capitation per “belly button” without meds is R 90.00 per month. So, if you service a panel of NHI patients numbering 1000, you will receive, based on these calculations, R90 thousand rand per month or R1,080,000.00 per annum, whether you see one, or all of the one thousand state patients in that month. The estimated consultation frequency of patients acquiring cover for the first time (like new NHI patients) is higher than the usual 3.5 consults per insured life per year, so let’s say it is 4.5 consultations per year. This will result in a consultation fee of R 240.00 per consultation in today’s money if you saw all of your cohort 4.5 times per year. The skill and art of successful capitation is keeping your patients healthy, educating them in PHC, and having nursing staff in your practice to deal with these aspects which are essential to the health of the nation. Provided that you have good quality assurance measures in your practice, patients are seen fairly and not turned away or told that you are “full” except for medical aid patients, capitation can work to your and your patient as well as to the states long term benefit. Before you even consider capitation or service any low cost plans you need to know your practice running costs on a per hour, or even better, on a per minute basis. You need to analyse your costs of running, each staff members contribution to your bottom line, each health plan which you service, whether you should dispense or not, and decide which plans are worth your while , and which should be ditched. Government want the concept of a “1 stop shop” and is opposed to doctors practicing in isolation. HPCSA states that you may share rooms with anyone on the same HPCSA register; hence the concept of Group Practice has been mooted, where doctors in the practice can be Partners, Associates or locums. The income from GP services rendered is handled in a manner dictated by the practice agreement. All of the above can pay the practice rentals which are market related, and not volume related. The also may not pay a % of their turnover to the practice landlord ( ie the GP). Signing numerous low cost contracts, especially plans which purport to be medical aids and which are actually “demarcation” products, is fundamentally unsound business practice until you know the answer to your running costs. It is no good to “feel busy” while you lose all the way to the bank! Watch your cash flows, your age analysis, and control the clerk which runs your accounts very closely. Once their period of grace has expired they will have to register with the CMS as a medical aid, or they will need to cease business. You don’t want to be involved at this stage as you could be in a battle to realise your book debt. Investigate your practice’s spare work capacity, and your ability to cost shift work on to hired nursing staff who may be able to do your or your locums work at a better hourly rate. Only then will you be in a position to understand whether low cost products , and even a future NHI offering will be for you or not! And remember that NHI will not replace all of your FFS patients, at least not before 2025 or thereabouts, during which time the 2 systems will run in parallel. The Minister spoke of a Unitary Tariff and that all patient liable Co-payments will end? What does this mean and will he cap all medical service prices? The MSA bill read with the NHI bill, suggest rather that state will determine a tariff only for Drs who are contracted to the NHI for certain services and it is for THOSE services, that there can be no co-payments, and that the set tariff is in full and final settlement. Remember that, in current legislation, for a PMB, no co-payments are permitted, and the schemes must pay in full, on invoice price. Where possible, schemes currently refer patients with PMB conditions to cost efficient network DSPs, hospitals, treatment plans and medication, funded in full with (no co-pays , unless the pt. goes out of the DSP). The new “Comprehensive Service Benefit Package” (CSBP)replaces the PMBs. It’s meaning is not yet clear but there is a suggestion that it will include primary care features and GP services added. Watch this space. It is this new CSBP which will not allow co-payments, which is no different to the current PMB regulation on co-pays. This will include registration of your income, claims, earnings and is unclear as to its purpose? A Patient register is also envisaged. By definition, this will contain highly personal info on everyone. There are huge concerns in data security, with what has happened at Yahoo, and with the Panama Papers, Ashley Maddison etc. There is a proposal to permit schemes to charge only a maximum of 20% of adult premiums for children and young adults. This needs to be thought through carefully as it will possibly just cause a blow out at main member level. This will certainly weaken schemes which are currently only able to protect against rampant anti-selection by using 3 month general and 12 month disease specific waiting periods. This will, if permitted, drive up premiums, to cover increased costs. The Bill contains a proposal to significantly increase the powers in the Registrar enabling him/her to unilaterally change rules of schemes if they are in conflict with NHI, amend payment rules and rates, set administrators fees etc. The Registrar can change the benefits of schemes if they overlap with NHI benefits fuelling concerns that medical aids will only be permitted to offer services which are complimentary to NHI. Deeper analysis of the wording however suggests that the NHI will run in parallel with the MSA. Currently the registrars powers are significant, and the spectre of an aberrant registrar is well known, and sufficient to cause alarm going forward. Finally, the fact that there IS a Medical Schemes Amendment Bill makes it clear that Medical aids will be around for the foreseeable future. The Pilot phase 1 which is over (this ended in 2017). we are currently in phase 2 which will focus on the vulnerable and needy from 2018 to 2022, and will have a heavy bias to addressing the state clinics, hospitals and staff. 2022 will see phase 3 commence with private providers being approached to offer services on an all willing provider basis at a price offered by state. Private Providers may be offered to do sessions within the public sector, in PPPs, esp. Western Cape. The Qualicare group of doctors is well placed to service these needs with willing participant members and shareholders on an all willing provider basis. Please make sure that you have sent us your practice self-accreditation for which is on our website. The actual wording in the draft bill is at variance with many of the messages released to the general public, and differs from the media and the minister’s releases. Remember that NHI has been politicised for some time now, and is seen as a quick win election tool. Currently there is little or no detail on how NHI will be funded in the bills and as such, inferences have to be drawn from what is NOT said. This is unacceptable to the average tax payer. Treasury still has the most important say in the implementation of NHI and their budget for NHI is 4 billion Rand over the next 3 years, as opposed to R180 billion budgeted to healthcare in general. The economy is not growing to allow higher expenditure on NHI. RSA has been affected as an emerging economy by the Turkish crisis, the Venezuelan crisis, and Trump’s next SMS…..
State capture, massive corruption and political uncertainty has not only drained huge resources from the fiscus but does not augur well for investments into RSA. The tax base has not seen a meaningful increase in numbers of tax payers or revenues. There is a fresh wave of emigration, so tax revenues could shrink instead of swell. As a result, a steady, phased in process of elements of NHI is expected, with no sudden increase in taxes, SDLs, cancellation of medical aid rebate etc is envisaged as opposed to a “Big Bang approach”. Treasury has the final say and it is not in favour of cancelling tax rebates on medical aid subs as the tax credits, (which minister says will give the state 20 billion rand), and which in reality keep millions of medical aid patients out of the state health sector.) Treasury has however agreed not to increase the Rand value of the Medical aid tax credits by the full CPI value, and have only increased it by 3% increase instead of 6 % (the accepted figure for CPI). It is praiseworthy therefore that the Govt is focusing the period from 2017 to 2022 on improving their offering to the very needy in the public sector, maternal and child health, indigent, mentally challenged, orthopaedics (hip replacements, radiation oncology, ophthalmology (Cataract surgery) and high risk maternity all come to the fore. Indeed, private healthcare administrators have already been asked to tender for the administering of the necessary funds to pay for care from private providers in these categories. The NHI focus will thus not be on replacing the private sector for the next considerable number of years and current Medical schemes will coexist with the NHI, and in all likelihood, should not disappear. It should be remembered that the findings are recommendations only however the Commission has significant gravitas that negative findings could result in investigations being initiated by the relevant authorities. It has been reported that there is evidence of certain amount of bias in some of the recommendations and conclusions, possibly to produce desired results. Hospitals have too much market power. Supplier Induced Demand (SID), by Hospitals and medical professionals. Hospitals tend to attract specialists with various offerings like share- holding, subsidised rooms and food etc, which concentrate specialists around these units. In return specialists tend to over-utilise the hospital services and technology, resulting in Supply Induced Demand. The Fee for Service system also lends itself to over servicing. Supply Induced Demand is not being managed either by specialists, their representative groupings, and is tacitly encouraged by hospitals. Suggestions to Implement value based contracting, (pay for quality outcomes) and endorse Multi-disciplinary teams (MDTs) have been made and have much merit. Currently little control in issuing of licenses for private hospital beds by the provincial licensing authorities. The HMI issued scathing commentary on HPCSA’s Ethical rules and the need for their urgent change. Suggestion of a regulator to license doctors, Hospitals, pricing, quality, licensing units etc. (Remember that the Certificate of Need, (Part of the National Health Act), is still in the wings and will, possibly be utilised at some stage in the future. HMI recommended establishing a registry of disease outcomes, and quality measurements in healthcare. HMI suggested that all stakeholders come together to discuss rates, going forward. This was unthinkable prior to the report, as everyone was concerned about horizontal collusion. The DOH is concerned about setting up such a body to regulate tariffs and possible legal challenges to this in the future. HMI criticised Schemes and their plan offerings as being too complex and confusing to members with a plethora of options which are not understood by patients. There is a perception that Costs are increasing and cover decreasing. HMI therefore suggested that all schemes have a mandatory common package of basic benefits, to which the “bells and whistles” could then be added, as affordable add ons. HMI recommended a central repository for data as Schemes were unwilling to share data freely. Qualicare will be submitting our response to the various bills and HMI report , much along the lines of this article but we request all interested practitioners supply us with their thoughts by no later than the 14th September 2018 to allow us to include them in our report.